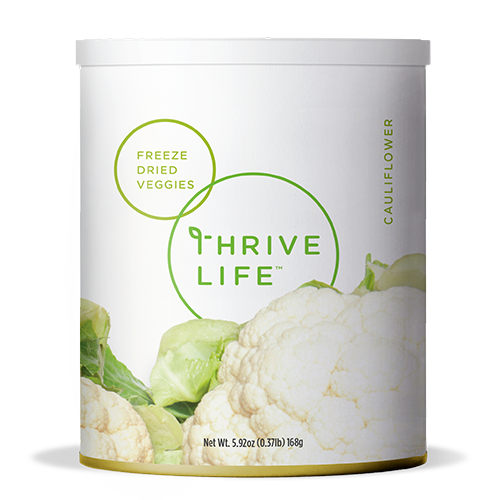 THRIVE freeze-dried cauliflower is absolutely delicious when used in creamy soups, casseroles, and even garden salads. This unique vegetable reduces toxins in the body and provides you with essential vitamins. As with all THRIVE freeze-dried products, THRIVE Cauliflower is guaranteed to taste fresh for years to come. Whether you try it boiled, steamed, or stir-fried, you will love the fresh taste and healthy rewards. Add 1⁄3 cup of water to 1 cup Cauliflower; let soak 5-10 minutes or until tender. These come in small florets similar to our Broccoli, perfect for tossing in soups. Make your mashed potatoes a little healthier without compromising taste - just add a cup of cauliflower for every pound of potatoes.